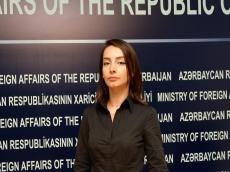 Azerbaijani experts thoroughly study the US sanctions against Iran and their possible implications for the economy of Azerbaijan, Azerbaijani Foreign Ministry spokesperson Leyla Abdullayeva told Trend. She was commenting on the US sanctions' possible influence on Azerbaijan's economy. "Iran is an immediate neighbor and an important partner of Azerbaijan in many areas. At the same time, the multilateral relations that exist between Azerbaijan and the US are important for us," said Abdullayeva. The US sanctions against Iran entered into force on Nov. 5. Sanctions will cover the oil exports. US President Donald Trump announced in May that the US was withdrawing from the agreement on nuclear program with Iran. He also reported on the restoration of all sanctions against Iran, including secondary ones, that is, against other countries doing business with Iran. The US re-introduced part of the sanctions against Iran on August 7.